Natural Gas Vehicles: Why Aren’t We Buying Them? 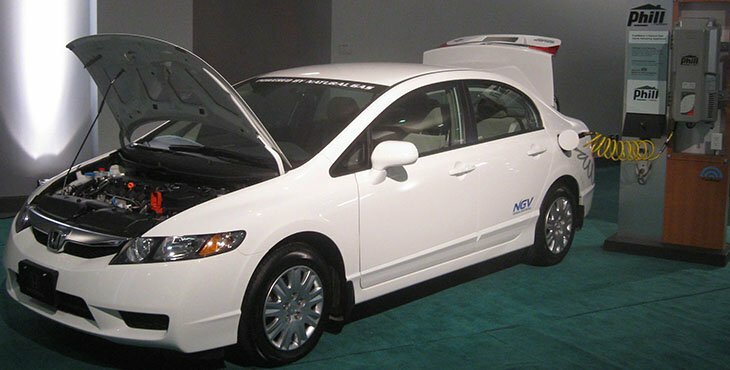 Remember the hype back in 2012, when Honda released its natural-gas-powered Civic across the U.S.? No? Maybe you were distracted by the predicted Mayan apocalypse. Anyway, it was a big deal: Finally, anyone could drive a compressed natural gas (CNG) car, which is both cleaner and cheaper to operate than conventional-fuel cars. That’s why now, five years later, we’re all driving… the same old conventional-fuel cars. What happened to natural gas vehicles? Why aren’t they more common? And are there still advantages to driving CNG cars? Here’s everything you need to know. There are two types of CNG vehicles — Liquefied Natural Gas (LNG) and Compressed Natural Gas (CNG). Both are fuel-efficient vehicles that burn low-emissions fuel that’s better for the environment than petroleum-based fuels. They aren’t expensive to build and don’t pose any danger greater than that of traditional gasoline vehicles. Here are the pros of driving a CNG car. The fuel’s cheap. Because of the rise in fracking — an efficient, if environmentally problematic, method of extracting natural gas from underground shale —natural gas is abundant and inexpensive. CNG vehicles have low emissions. Compared to gasoline, compressed natural gas reduces carbon-monoxide emissions by 90 to 97 percent and nitrogen-oxide emissions by 35 to 60 percent. Natural gas is also domestically produced, for the most part, so driving a CNG car means you’re not dependent on foreign oil. Compressed natural gas vehicles look and feel like conventional cars. While their engines and fuel systems are modified to make use of natural gas, CNG vehicles are otherwise quite similar to existing gasoline or diesel cars. You can even convert a conventional car to run on natural gas. Car insurance rates may drop. Being that you have a more eco-friendly vehicle, you may find that switching insurers may land you a cheaper car insurance premium. Compare.com can help provide you with free car insurance quotes online if you want to see how much you can save. CNG hybrids are available. 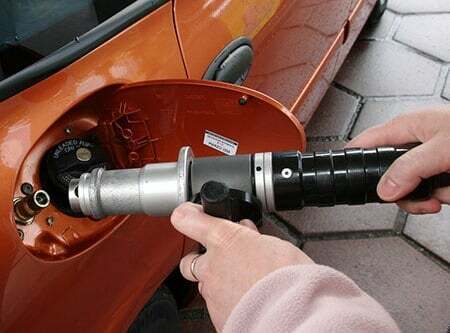 Some CNG cars are designed to run on both CNG and gasoline, eliminating “range anxiety” and allowing the driver to go a long, long time between fill-ups. The 2016 Chevrolet Impala Bi-Fuel can go for about 600 miles on the highway when both tanks are full. You get a few perks for driving a CNG car. In California, CNG vehicles can get a decal that allows them to use the carpool (HOV) lanes even with a single occupant. Your state may offer tax incentives and other rewards. While CNG is cheap, it isn’t always cheaper than gasoline. If a gallon of compressed natural gas costs $2.25, that sounds pretty good — but if gasoline costs $2.50 per gallon, you’re not saving a ton. Fuel prices can be volatile, so savings aren’t guaranteed. You need a nearby network of CNG fuel stations. Look at CNGNow’s map of stations in the United States, and you’ll see that some metro areas — like Boston, New York City and Los Angeles — have dozens of fuel stations. But smaller cities, like Memphis and New Orleans, may only have one, and vast parts of the country have none. Home fueling is possible but can be a slow process. CNG fuel efficiency isn’t great. Compared to gasoline, natural gas is cheaper and cleaner — but it’s just not as good a fuel. 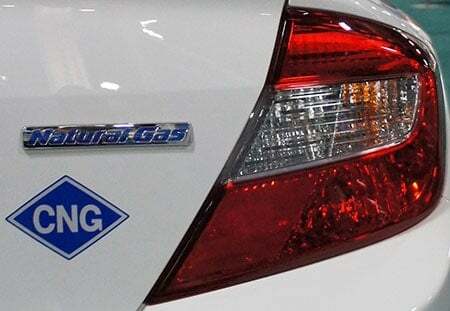 Fuel efficiency for compressed natural gas vehicles can be difficult for the consumer to calculate, as the metric for fuel efficiency in CNG and LNG vehicles isn’t actually miles per gallon (MPGs), but is MPGe — miles per gasoline gallon equivalent. The 2015 CNG Honda Civic gets 31 MPGe, according to federal fuel-economy stats. The 2016 Chevrolet Impala Bi-Fuel gets 19 MPGe. That’s not knocking anyone’s socks off. CNG cars are more expensive. On Cargurus.com, the price of a low-mileage 2015 Chevrolet Impala Bi-Fuel varies wildly, but we found a few listed for around $23,000. Considering they cost $37,000 new, that sounds like a good deal. Trouble is, you can buy a newer, nicely equipped conventional Impala for the same price — or less. Compressed natural gas vehicles are hard to find in the U.S. consumer market. Honda stopped manufacturing the natural-gas Civic in 2015. Chevrolet discontinued the bi-fuel Impala in 2017. Aside from fleet sales, there’s really no automaker offering CNG vehicles in the U.S. market right now. Should you buy a CNG vehicle? Despite the many drawbacks, CNG cars have their devotees. And there’s a good chance gasoline prices will rise, making low-cost natural gas more appealing. If you live in an urban area with plenty of CNG fuel stations, or you’re willing to invest in a home fueling system, a natural-gas vehicle might be the perfect fit for your daily commute. Then again, if your primary goal is to drive a cleaner, greener car, you have lots of options! Is Biodiesel Still a Reasonable Alternative? Using a 100% biodiesel reduces carbon dioxide emissions by 75 percent as opposed to a 20 percent biodiesel blend which reduces carbon dioxide emissions by only 20 percent. Despite not being readily available in most U.S. states, biodiesel doesn’t require the creation of new or additional infrastructure to support it the way something like natural gas or hydrogen fuel would. Existing gasoline tanks could be outfitted or repurposed to support the storage and pumping of biodiesel fuels. Another benefit to biodiesel is that it doesn’t pose any new or additional safety risks. Biodiesel has a considerably higher flashpoint than traditional gasoline. Biodiesel’s flashpoint rests at temperatures greater than 233 degrees Fahrenheit versus traditional gasoline at -57 degrees Fahrenheit. This means that biodiesel is considerably less dangerous to transport and handle. It is also easier to clean than petroleum products and less hazardous to wildlife. One downside to biodiesel is that it begins to solidify at low temperatures. To make biodiesel viable in cold-weather environments a special fuel system would need to be created to help insulate. Biodiesel does pose one very unique problem. Since the raw materials used to create it are also food sources, an increase in production of these food sources for use in the making of biodiesel will decrease the availability of that food product for use as food. Growing and processing these plants also requires a lot of energy, some of which comes from coal power, which leads many people to question if this form of fuel is actually more efficient and eco-friendly. The higher production can also drive food prices up as we saw happen with the price of corn after the government implemented the addition of ethanol to gasoline throughout the US. Biodiesel in the U.S. has largely been produced using soybean oil. However, there are other plants being used in other parts of the world that have a high output of oil and use fewer resources. The top plant being studied for development in U.S. biodiesel production is a plant called pongamia. The pongamia seed is roughly 40 percent oil, which means a higher crop yield, which in turn means a greater yield via a smaller supply. This suggests that a higher production volume is possible using less farmland. Another plant that is currently being used in Malaysia to help support the E.U. demand for biofuel is a shrub-like tree called Jatrophas. Discarded Alligator Fat (as waste from the skinning/ leather-making industry. Roughly 15M lbs produced annually). Can I Use Biodiesel in My Car? It’s not likely. Biodiesel caught everyone’s attention when it was discovered that older diesel engines produced by Mercedes were able to run on the environmentally friendly fuel. The problem is, most cars can’t do this and doing it can void your warranty. Biodiesel doesn’t play nicely with numerous components common in today’s cars including any copper alloy, a number of common plastics, and certain kinds of rubber. So if you’re interested in using a biodiesel vehicle, then it’s best to buy a vehicle equipped to use biodiesel fuel.